A Software Engineer, a Hardware Engineer and a Branch Manager were on their way to a meeting. They were driving down a steep mountain road when suddenly the brakes on their car failed. The car careened almost out of control down the road, bouncing off the crash barriers, until it miraculously ground to a halt scraping along the mountainside. The car's occupants, shaken but unhurt, now had a problem: they were stuck halfway down a mountain in a car with no brakes. 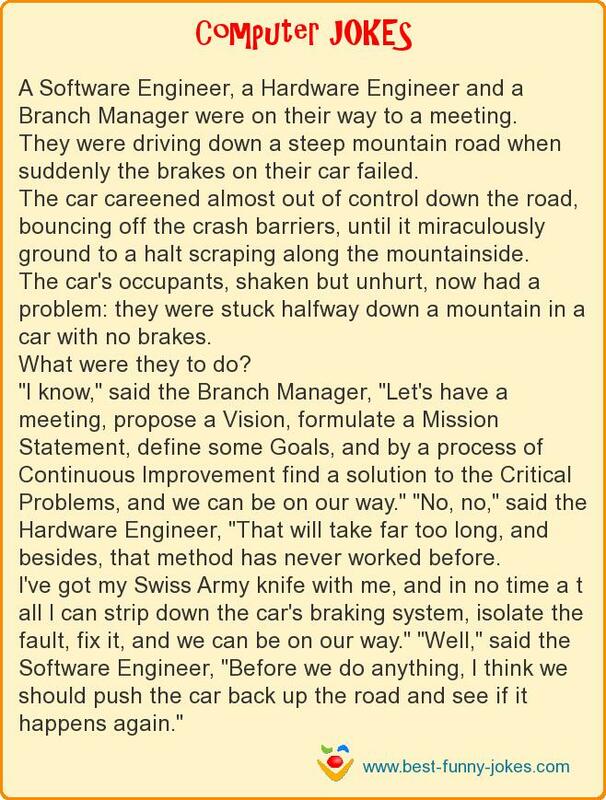 "I know," said the Branch Manager, "Let's have a meeting, propose a Vision, formulate a Mission Statement, define some Goals, and by a process of Continuous Improvement find a solution to the Critical Problems, and we can be on our way." "No, no," said the Hardware Engineer, "That will take far too long, and besides, that method has never worked before. I've got my Swiss Army knife with me, and in no time a t all I can strip down the car's braking system, isolate the fault, fix it, and we can be on our way." "Well," said the Software Engineer, "Before we do anything, I think we should push the car back up the road and see if it happens again."